It's hard to keep up with the changing names and faces Mr. Di'Anno's played under the last two decades since quickly rising to fame fronting Iron Maiden in their formative years. But it's during those formative years as the leaders of the NWOBHM movement in the early '80s that many remember and revere the singer. "The Beast In The East" finds Di'Anno and band -- actually that's "Paul" Di'Anno now, for anyone keeping score, pulverizing the poor people of Poland, suddenly a hot bed of Heavy Metal resurgence at a time when economic recovery and city wide renovation is at hand. And the rather impressive gathering in a respectably-sized Cracow club was treated to a mind numbing selection of classic Maiden tracks and Killers material. Treating this tour as a comeback of sorts, it'd be easy to criticize Di'Anno of copping too far a claim to a dead and buried past that he's refused to let go. Admittedly, during an included one on one interview, the singer laments languishing too far into the vaults for fear of waning credibility on his own merit -- one that's actually seen him and his periodic bands produce a well spring of viable metallic anthems -- however, there is something to be said for giving the people what they want. And rare is it indeed we might find the worldwide supernaut that is today's Iron Maiden digging so deep as to resurrect a tune like "Transylvania," "Killers," or "Remember Tomorrow" with their still climbing collection of epics. Whatever the impetus, there's no arguing the talent, focus and ability of Di'Anno and his current crop of bandmates who capably conjure memories of a glorious past, effortlessly recreating those quick, catchy and unusually complex riffs, fills, harmonies and raw energy that defined and set apart Maiden from the rest-- and then effectively blowing them away in a blaze of fierce fretwork and Punk-level energy. Di'Anno, appearing scalped, scruffy and sixty pounds heavier, stalks the stage and cuts an imposing if unlikely figure that's one part Fred Durst and another part G.G. Allin; the beast "unleashed" in the East much to the pleasure of the proud crowd of Poles raising their fingers and fists at every drum beat and song break. The other four band members power through age old classics as the opening instrumental theme, "Transylvania," the "Killers" staples, "Wrathchild" and title track, the rousing "Phantom Of The Opera," and concluding crowd pleaser, "Running Free." Clearly the old Maiden set was met with the greatest roar, but not to be overlooked is Di'Anno's Killers material which during the last decade, helped redefine and potentially revitalize the once foundering vocalist's musical career that's been paralleled by a number of off stage scuffles with law and the London underground. 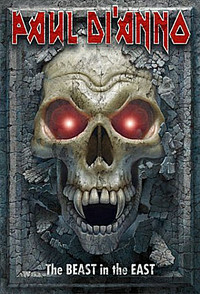 Additional tracks like "Marshall Lokjaw" and "The Beast Arises" from the outstanding '92 release, "Murder One," are faithfully restoring examples of pride and perseverance for the veteran singer, not to mention retaining the fine art of the power chord in the wake of Metal's then ill-timed decline; The Speed Metal attack of "Impaler" or the toned down and dramatic effect of "Dream Keeper" display the diversity within he and the band, spotlighting Di'Anno's distinctive voice and vocal ability at once soulful and soaring; and to some maybe, surprisingly so after all this time. Noticeably absent are songs from the largely ignored 1997 "Menace To Society" H/C crossover release and older "Battlezone" stuff -- with among some five albums to pick from! And who knew? The DVD is loaded, however, with bonus extras, including two bootlegged concerts from Poland and Norway, both of which are shorter, darker, and sloppier from the small stage. Also included is a revealing Di'Anno interview where fans will discover Di'Anno's early age Punk leanings and what he didn't like about Maiden's "Killers" album. In addition, there are three bonus audio tracks, never before released and probably for many, should have remained that way. For anyone who actually remembers or cared anything for Di'Anno's first post-Maiden solo record, these three will peg you squarely in your aching heart. Otherwise, they're inexplicably cut short anyway and can be stepped over. Indeed, the menacing frontman has moved far and away from his days of singing about "Flaming Hearts" and "Antigua," however, he's never quite gotten due recognition as a singer in the intervening years since Maiden paired with Bruce, and its in these softer, silkier moments that Paul's voice really shines. All things considered, "The Beast In The East" is a sharp-toothed presentation of pure Metal that'll rattle the cage of aging Maiden fans, turn a few heads, if not bang 'em into submission, and legitimize the fact that Di'Anno is in fact still alive, and when he's got his priorities straight, can conjure a command performance of grit and glory on at least a semi-grand scale.